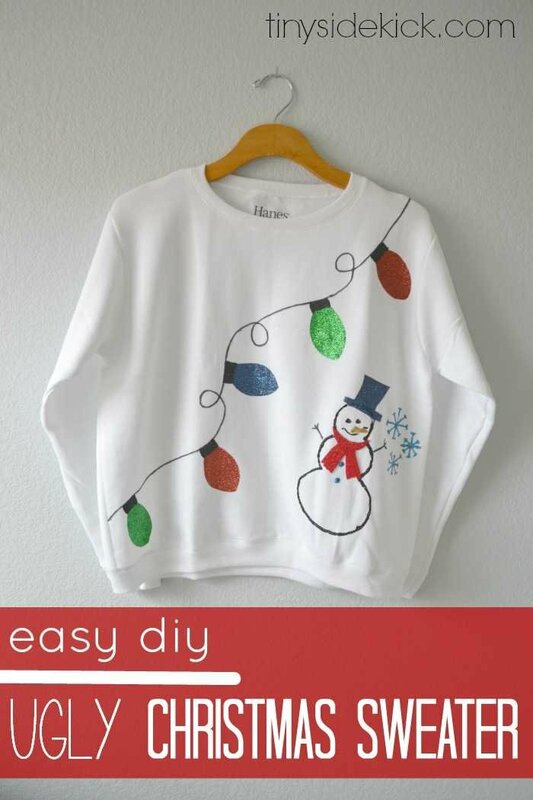 Inside: Create your own ugly Christmas sweater with this fun easy throwback to grade school fashion! This post written as part of a paid campaign with I Love to Create and Blueprint Social. But of course opinions are 100% my own and I’m happy to share fun products with you. You can see my full disclosure here. One of my favorite kinds of holiday parties is the classic ugly Christmas Sweater party. And let’s be honest, homemade adds a little bit to the tackiness don’t you think? 4th grade called and they want their puff painted sweatshirt back! Remember those. My favorites were the ones with half of the heart that said Be Fri and your bestie had the other half. Ok. 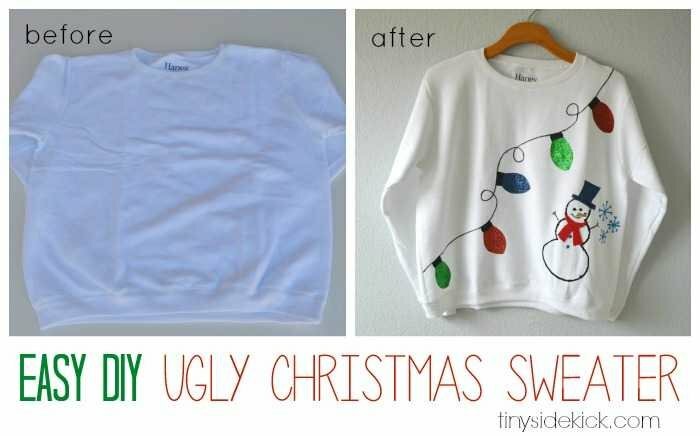 So let’s channel our inner 4th grader that is itching to get crafty and make our own easy Ugly Christmas Sweater shall we? Step one is to find a really inexpensive sweatshirt. I picked up this plain white one at Walmart for about 5 bucks. I chose white cause I thought it would be the easiest to work with. Then you’ll need to grab some goodies to decorate with. Tulip makes some really awesome fabric paints that won’t make the material stiff and every tacky Christmas sweater needs glitter right? 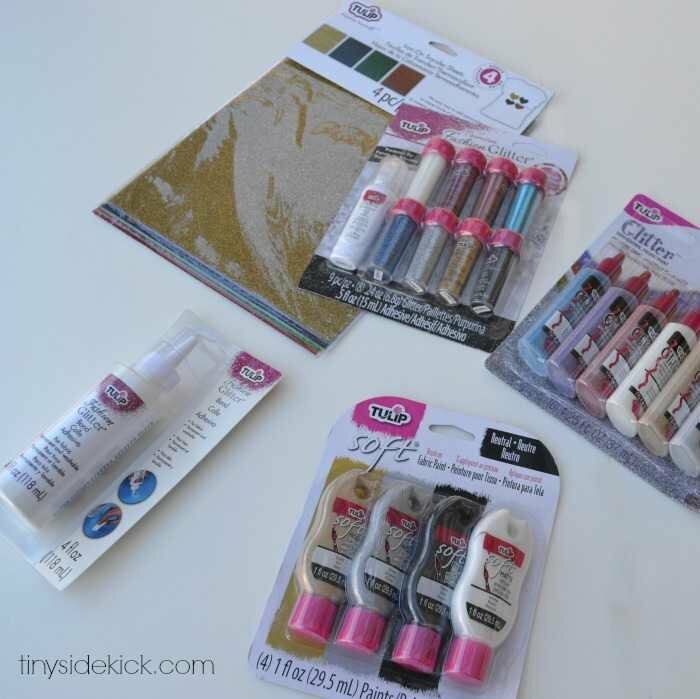 So you’ll definitely want to pick up some glitter iron-on transfer sheets, and the glitter 3 dimensional fabric paints or the fashion glitter which you sprinkle on. I used both on mine. Oh, and don’t forget some glitter bond. It is a perfect adhesive! 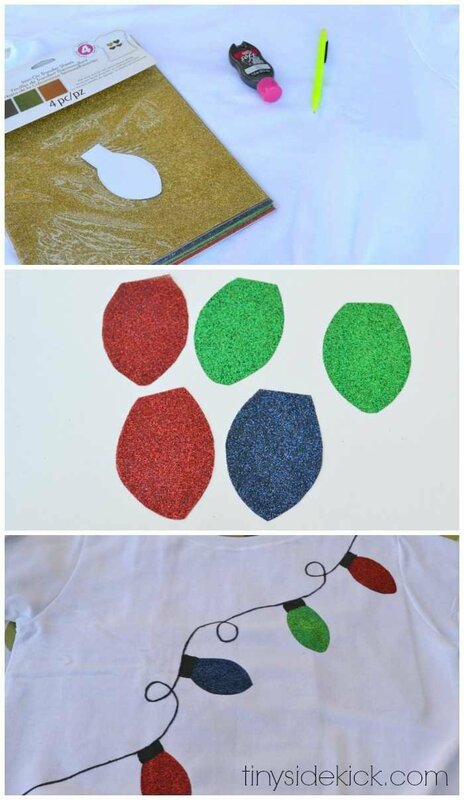 My favorite part of this project was definitely the glitter iron-on transfer sheets. They were really easy to use. You can see I used them for the giant Christmas lights I had strung across my sweater. I drew the cord on with a black Sharpie. Then I made a light bulb template on a piece of paper, cut it out, traced it onto a glitter iron-on transfer sheet (while it was still in its plastic sheet) and cut it out. I placed each cut out bulb (without the plastic) glitter side up about half an inch down from the string, laid a paper towel over it, and ironed it on. Once those were on, I filled in the space between the bulb and the string with a little bit of black soft fabric paint using a small paint brush. I let my little lady decide what we were going to add next, and she came up with the idea of a snow man and snowflakes! For this part I used the fashion glitter that you sprinkle on, the glitter three dimensional fabric paint for the nose, buttons, and snowflakes, the iron-on transfer sheets for the hat, a Sharpie for the eyes, mouth, and arms, and a piece of glitter felt for the scarf. 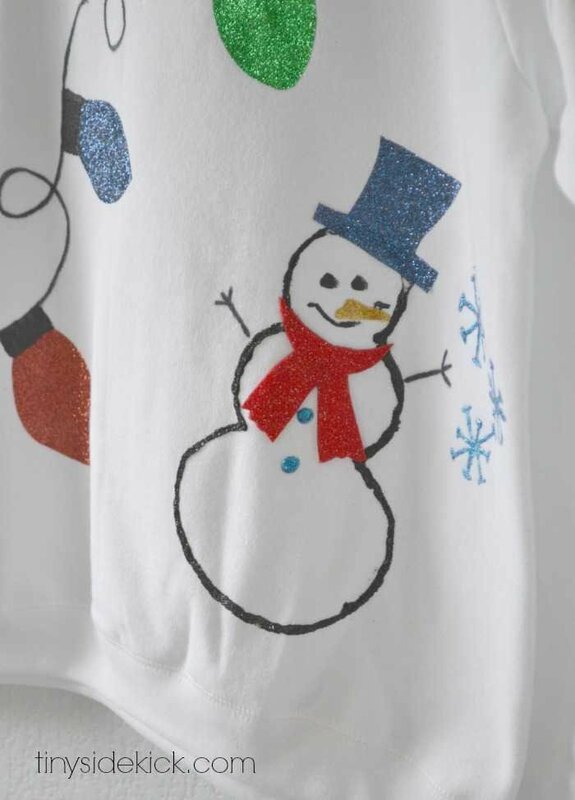 Again I made a template for my snowman, laid it on the sweater, and traced around it with the fine tip fashion glitter bond that comes with the fashion glitter. Then I removed the paper and sprinkled the black fashion glitter pretty liberally over the outline and dumped it off. While it was drying I drew the carrot nose, buttons, and snowflakes on with the glitter three dimensional fabric paint. I also cut out and glued on a felt scarf using the glitter bond as glue. After it dried overnight I ironed on the top hat. 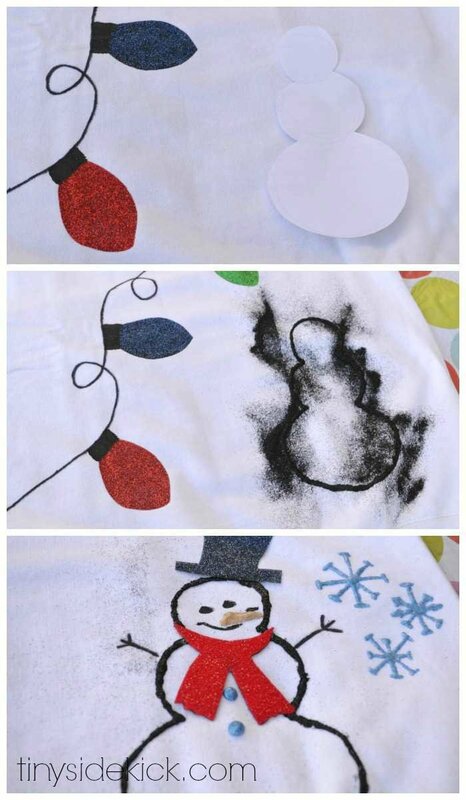 TIP** Try your best not to touch the iron to the glitter outline of the snowman. The heat melts the outline and it will smear. It was easy to avoid, but if your design mixes the iron-on transfer sheets and a lot of fashion glitter, do all your ironing first and then add the fashion glitter. I really like how this came out and it was a lot of fun to create. You could go super tacky, or keep it sorta cute like I did. So how about it? Are you heading to an ugly Christmas sweater party soon? Love the Christmas lights on the sweater!!! Love this. One of my favorite scenes in Bridget Jones’s Diary is the party with everyone’s hideous Christmas jumpers. Too funny! I hope you will link it up at the Found & Foraged Linky Party! http://www.thebigrevealblog.com! Your sweatshirt looks exactly like something I would have worn to school in the mid-90’s! Totally! That is exactly what I was going for. That and the classic 2nd grade teacher holiday sweatshirt. I actually really like this sweater…. I know! I do too! It is tacky, but so festive. How could you not right?